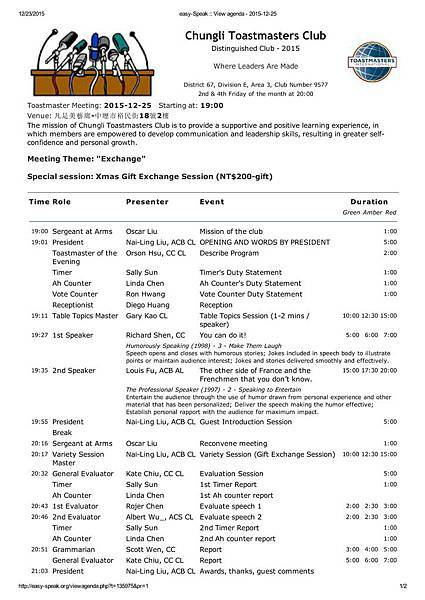 You are invited to join the meeting of Chungli Toastmasters Club on 2015-12-25. In this special evening, the stars will start to shine at 7 pm in Chungli Club. It is recommended to wear sunglasses, for our meeting room will be glowed brightly by shining stars. The eternity star, the legend of our club Louis will deliver his A43 speech. Louis is going to share his exotic experience in France. And his evaluator is Albert, the pillar of the club, quoted from Albert “I have been evaluated by Louis for 10 years. It’s time to payback!” It is just like the collision of emerald against ruby. What kind of sparks will they produce? Let’s wait and see. Furthermore, in this meeting, we are honored to have a devoted Toastmasters, Rojer, our area E3 director. He is going to provide suggestion and feedback for our outstanding EVP Richard. The gentle singing star is going to deliver his A4 speech. And our forever superstar, Orson will be the Toastmasters of the Evening. 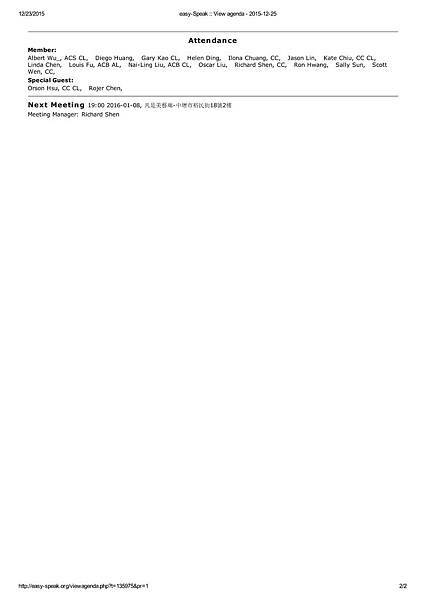 Our prince of charming has set the meeting theme as “Exchange”. What would you like to exchange? If you can exchange anything you want? There is more to come....Come to find out. Special gift exchange session: Please feel free to bring a gift with around NT$200 to join the gift exchange session on this special day.